Silver has long been known as a bacterial killer and used extensively by the medical profession. Copper is recognised as one of the best killers of algae ever discovered and zinc is extremely effective in killing black algae, which is pervasive in warmer climates. The Aligator System uses a water ionisation process to generate metallic ions of copper, silver and zinc into the water. The Aligator Electrodes (copper electrodes) work by harmlessly charging ions in the water, creating a residual disinfectant/algaecide throughout the whole pool. The ions are pH neutral, non-corrosive and have no effect on the human body, unlike chlorine making this a particularly eco-friendly water purification system. No other system other than chemical saturation will do this. The typical concentration of chlorine needed to provide a safe swimming environment is 3ppm or 3 parts of chlorine to 1 million parts of water. The Aligator Water Treatment System uses a low level of 1 ppm free chlorine, in accordance with the recommendations of the PWTAG (Pool Water Treatment Advisory Group), to take care of water clarity and to deal with sweat, urine, suntan oil, body oil, make-up and organic matter such as leaf debris. 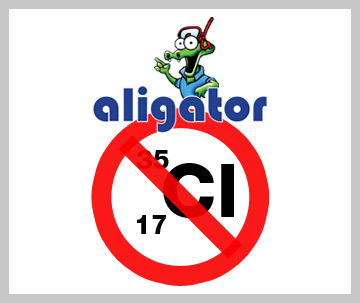 Therefore, by using the Aligator System, chlorine levels can be reduced by 67%. The percentage savings are directly equivalent to financial savings in the cost of chlorine. One additional benefit of the Aligator system is that the disinfection provided by the copper and silver ions is residual and remains in the pool. Unlike the chlorine it does not evaporate in sunlight and is not affected by short term power cuts. Further chemical cost savings may be made because the silver and copper ions produced by the Aligator system removes the need for additional flocculents, water clarifiers and algaecides. The exact savings related to these chemicals will depend on the individual pool size and usage, but using the Aligator system removes the need for these additional, often expensive chemicals. Best of all, the Aligator Swimming Pool Water Purification System programmes itself! Once the pool size has been entered into its computer, you can sit back and relax. The Aligator system continually monitors the condition of the Aligator electrodes and pool water and alerts you if attention is needed. All in all, the perfect ionic water treatment system, that eliminates bacteria and algae in your swimming pool and offers a brilliant alternative to chlorine. For more detailed information on how the Aligator system works, please refer to our instruction manual.